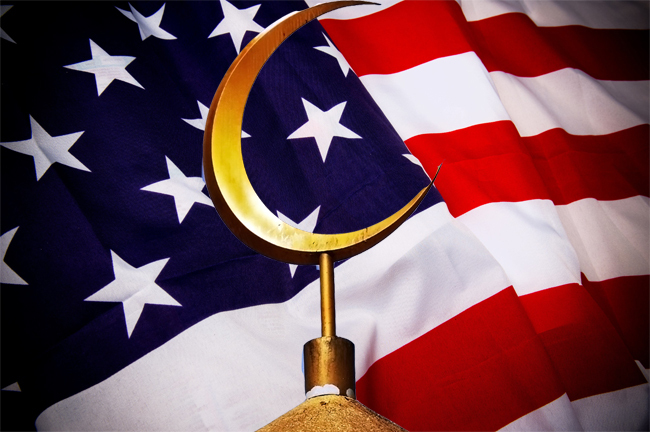 Mosques over America: Will we live by the First Commandment or die by the First Amendment? One of the more memorable moments in Cecil B. Demille’s The Ten Commandments comes when Charlton Heston – I mean, Moses – comes down from Mount Sinai with the Ten Commandments of God to man. He makes this dramatic return after a long absence during which the people of Israel engaged in rank idolatry and open rebellion against their Creator. As Christians, we understand that Christ has lived the obedient life that we never could and that He has done so on our behalf, laying Himself down as a sacrifice for our disobedience so that we are no longer “under the law” as the standard by which we must personally earn, attain, or maintain salvation. One of the great, beautiful truths of the Gospel is that our salvation comes by grace alone through faith alone in Christ alone, who is the embodiment of the Law, the Word Made flesh, and who loved the Law faithfully and perfectly, all to our account. That is how much Christ the King loves both the Law and the people for whom He died. Again and again, Scripture provides us with the way by which we can test our faith; the means by which we can answer the question, “Am I really saved?” And each and every time, the answer has to do with testing our profession of love for Christ against our desire for obedience to all that He has commanded in practice. One great, bold, and crystal clear dividing line between true Christians – those who have been supernaturally saved and transformed into New Creatures in Christ – and all other people, however much they may claim Christ or Christianity through their lips, religion, and traditions, is this: Those who are truly saved by Him will have, by His grace through His Spirit within them, a thirst, desire, and reverence for His commandments. They will desire to know about His law and commandments more and more clearly because they want to know Him more and more clearly, and they recognize that His Word and Law are revelations of His personal Nature. They are part of who He is. Therefore His people will seek repentance as they learn more and more about their sin through the revelation of His nature through His Word and His Law. And they will – again, all by His grace – each personally strive to apply His Word in every realm of their lives. Right here and right now. That is the Gospel and Great Commission on active display. That is true Christianity in practice…all by His grace and for His glory. And that is precisely the opposite of what is pitched and preached in most “churches” in America. Here again we see how true it is that both judgment and restoration always have and always will begin with God’s people, the one true Church. We face a stark choice at this moment in American history. Many stark choices, actually, but one rises head and shoulders above the rest, leaving all others in its inescapable shadow. That towering, culture- and civilization-defining choice is: Will we repent and submit to Christ the King, or will we persist in proud rebellion and destroy ourselves upon His unbreakable Nature? The ongoing plagues and ever-increasing stream of crises that are even now ravaging our culture should be making this point plain, but they do not seem to be doing so. Thus far, Americans are, as they have done for many generations, looking everywhere but to the Nature of God as revealed in His Word as the standard by which to measure everything and confront every challenge. 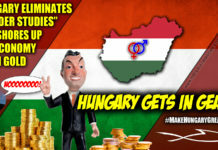 Instead, many rebels on the left look to the State, MSNBC, CNN, and the Democrat Party, while many church-going, Bible-reading rebels on the right seek first the advice of Rush Limbaugh, Mark Levin, Fox News, and the support of their favorite version of the State for “solutions” and a worldview to build their lives upon. They look to places where the Gospel and Great Commission commands of Christ the King are mocked through the disdainful act of dismissal without comment, as if they had the power or authority to deny the authority of Christ by simply ignoring Him. What profound (and suicidally stupid) arrogance! 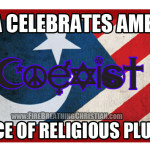 Such is the disdain of Fox News, CNN, the Republican Party, and the Democrat Party for the very nature of Jesus Christ. They will not have Christ the King to rule over them. They will not even hear of such a thing! On this, Republicans and Democrats can agree. Church-going protestants, homosexual activists, successful businessmen and sweet old ladies can all agree: They will not submit their lives to His rule right here and now. They simply will not have it. This is why these people are not only accustomed to “not hearing the Gospel” as a cornerstone of political, economic, or educational pursuits, but they like it that way. Their gospel, if they claim one, is neatly sequestered in “its place”. It may be taken out on Sundays or during Bible studies or for certain conversations with certain people, but it is certainly not held close as the essential core of truth in every realm of life right here and now. No, that sort of gospel is scary. It’s fanatical. It’s dangerous. What do statements like these inspire in you? Do you generally agree with them? Do you generally disagree? Do they make you proud? Do they make you sick? Have you ever even thought about them in this context? Have you ever thought about them in light of the First Commandment, in which God explicitly forbids allowing the worship of any pretend god in the land? I hadn’t thought of these things this way for most of my life, but here I am now, by God’s grace, trying to learn and submit to some initially hard, but ultimately beautiful truths, while hoping to encourage you to do the same. I do this because I love America and I love you, knowing that I can only love America and love you rightly by first loving God rightly, on His terms as He has clearly presented and equipped His people to understand them. I share these things now because we really are at a critical point in America. The hour is late. Judgment is upon us. By whose standard will we actively strive to live in every area of life? Are some areas for God and others for man to define and determine? Will we each personally put everything on the line and dedicate everything that we have been given by God to seek and apply His will in embrace of the true Gospel and obedience to the Great Commission? Or will we do…something else…anything else…the details matter little in the end. The right answer to these questions gives us all that we need to actively and successfully tackle the “big challenges” that can never and will never be soundly addressed by Fox News, Rush Limbaugh, Barack Obama, the Republicans, or the Democrats. When we repent of rebellion and pursue His Nature as lovingly revealed in His Word as the basis upon which we act in every realm of His creation, we can “do all things”…by His grace and for His glory. When we choose any other path – any other worldview or approach to life, however adored and steeped in tradition it may be – we choose darkness and death. That’s how things actually work in “the real world”. Defined and sustained by His unbreakable Nature as revealed in His perfect Word. 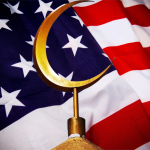 So, what do we do about Mosques and the open practice of Islam in America? Do we continue tolerate it and exalt such tolerance as a virtue? Do we continue to proudly champion this virtue as a value for the whole world to embrace? Or do we repent and believe…in action? That is the question, America. 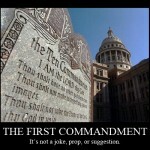 Or, put another way: Will we live by the First Commandment or die by the First Amendment? If you know of anyone who might appreciate this post, please share it. If you’d like to help support the Fire Breathing Christian mission, please click here. Please also “like” us on Facebook and feel free to sign up for new articles by email using the button in the upper right corner of the FBC home page. Thank you for your support! © 2015 Scott Alan Buss – All Rights Reserved. 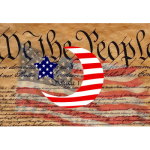 Islamic worship in American government? Sure. Why not? 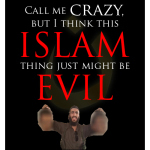 Call me crazy, but I think this Islam thing just might be evil. 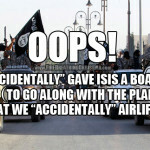 Oops, we “accidentally” gave ISIS a boatload of Toyotas. 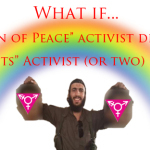 What if a “Religion of Peace” activist decapitated a “Gay Rights” activist (or two) in America? 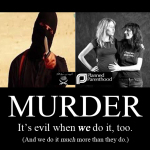 Another Islamic State beheading and another 2,700 American babies butchered. Will we repent? 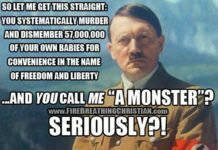 Openly Reject God’s First Commandment? YES! WE! CAN! 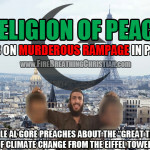 “Religion of Peace” goes on murderous rampage in Paris…as Al Gore warns about Global Warming from the Eiffel Tower. 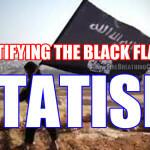 Will we worship America and protect Islam or will we worship God and defeat it? What kind of action? You repeatedly call for the removal of rights without clarifying how or what you intend to do with people who continue? From what I know of your bible, killing worshippers of other gods tends to be the norm. Is this what would happen? Would people be burning mosques down, dragging Muslims out and stoning them? In another article you say how god chooses his elect, and didn’t die for everyone. 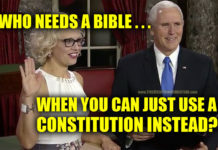 So, is what you’re saying that you would prefer a theocracy, where Christian values is forced on unbelieving and unable to believe population by gods elect, by the force of a sword? I’m asking this not to start an arguement, but because I wish to know. It almost seems like you leave this part vague on purpose. I also have noticed that you’re anti-state. Ditto. On a side note, you should give these a watch. In terms of politics, it’s one thing to be against something, but it’s another to be for something else. This is that something else.